In addition to our year-round fundraising and awareness efforts, National Inclusion Project puts on four main events annually. With new honorees each year and a full concert by our founder, Clay Aiken, the Gala is a weekend of friends, fun and celebration! Come see the who's who of NC show off their best moves and dance their hearts out to raise money for inclusion. A one-of-a-kind inclusion conference complete with professional development, personal connection, and plenty of play. Our nationwide awareness campaign in the spirit of the season. We need YOU to make it happen! 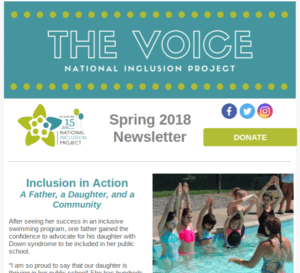 Read the latest issue of The Voice, our e-newsletter, to be in-the-know on all things Inclusion Project.